Audi recently introduced a special edition of its Audi A6 sedan to celebrate the sale of 6000 Audi A6 cars over a span of six years in India. The special edition Audi A6 executive class sedan is available in two engine options – 2.0 TDI and 3.0 TDI – at an introductory price of Rs 46.33 lakh onwards (ex-showroom Delhi). Audi has dropped the petrol variant from the A6 range but has announced that they will soon be launching the S6 which will sport the petrol engine. Keeping in line with Audi’s top down strategy, some key features from Audi’s flagship car – the A8 – are now available in the Audi A6. 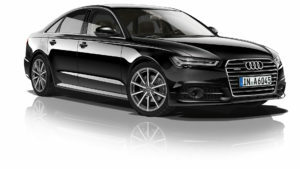 The special edition Audi A6 now comes equipped with Adaptive Air Suspension with Audi Drive Select, 4-Zone Air Conditioning, Rear Side Airbags, Bose Surround Sound System, MMI Touch, Comfort Key, MMI Remote Control, Front Co-Driver seat adjustment from the rear and LED headlights as standard. The first impression of a car is the way it appears on the outside and for A6 it is definitely a charmer. It is not one of those delicate saloons that look flashy from exteriors; in fact the aggressive styling made to the exteriors further accentuates the robust essence of the sedan. The first look at the sedan will make you hopelessly in love with it, all thanks to the bold front facet. The hood is wide and the two vertical hood lines flowing from the edge of windscreen to the radiator grille typifies the sporty character of the saloon. Use of chrome is done generously; the large pentagon shaped radiator grille featuring multiple chrome bars and the iconic four rings appears bullish. The chrome surround on the radiator grille renders it a neat finish. The agile Matrix LED head lights in front are inspired from the Audi A8. There are short creases on either end in-between the space between head lights and lower bumper. Drop to the lower end of the bumper and you will notice fog lights, air intakes and a hint of chrome that looks sporty. Side skirts too have been modified, it gets sportier. View from side is relatively sober as compared to front. The chrome finished outside door handles are way too plush, while the outside rear view mirror has to settle with the body matching colour. It gets power folding and adjustable functions along with integrated turn indicators. The large wheels ornate by multiple spoke alloy rims perfectly balance with the metal mass above it. A thin chrome lining carefully outlining the window frame adds charm to the side profile. Moreover, the sharp beltline running from C pillar right to the edge of the hood spells command. Hop to the rear to notice new tail lamps, exhaust pipes, tweaked bumper and a chrome strip placed on the lower edge of the boot lid. A slide and tilt all glass sunroof lends exquisiteness to the saloon. The upgraded MMI system can also serve as a 4G LTE mobile Wi-Fi hotspot for up to eight devices, and adds Google Earth data to the navigation system while providing a simplified Google search for POIs. The Google Earth feature is essentially form over function, however, as it can make the map more difficult to comprehend at a glance. The A6’s front seats are supportive and comfortable, remaining so even on long trips. The spacious backseat offers more real-world legroom than most rivals. The A6’s 14.1-cubic-foot trunk is slightly below average for the segment, but we’ve found it generous in real-world testing, and the rear seatbacks fold and offer a pass-through when more space is needed. The Audi A6 is available in an In-line 4 cylinder 2.0TDI engine and a V6 configured 3.0TDI engine. The 2.0 TDI engine has a front wheel drive while the V6 has the Quattro drive as standard. Even the transmission pack can be opted between the Multitronic and the S-tronic for different drive train.Even though this one is a luxury sedan which is primarily intended to spoil customers, the A6 succeeded in impressing us with its handling and suspensions quality. The power steering which features a new electromechanical drive makes it more convenient than the earlier models. The 2.0 TDI is not a performer at all but then when you strap yourself in the V6 motor, it is mayhem as it’s a lethal combination of massive size versus massive performance. It features air suspension with controlled damping. This damping makes sure that the vehicle is very quick in adapting the suspension setup according to the terrain. It nullifies all the redundant forces acting on the vehicle.In the 2.0TDI, the engine gets enthusiastic only in mid range as initially the lag in the engine is strong. It takes time for the 4 cylinder unit to produce enough power to propel this business liner. The engine is very balanced and gets juicy at the mid level only. Post that it takes its own linear time to grow in the power curve. The 3.0 TDI is a very sporty motor and has a split character compared to the smaller unit. It flexes its muscle very quickly. Even though we had a brief encounter with the 3.0 V6, it indeed brought an evil smirk on our face. As with most modern Audis, the A6 is a very easy car to drive. Yes, the steering does feel very light at high speeds but since these cars will be mainly used to doddle around town in, a lighter steering is indeed a boon. That said, it could certainly do with a bit more weight after a certain speed. The A6 is also a surprisingly easy car to look out of both in normal driving conditions and while parking. Of course, the rear parking camera and parking sensors are still pretty necessary in a car this big. Thankfully, the Audi A6 rides quite well too. On most uneven roads, the A6 does tend to absorb bumps and uneven surfaces really well to a certain limit when it then tends to feel uncomfortable. The Audi A6 isnt a corner carving handling machine either. In fact, this large sedan does tend to feel a little leary around the bends and when combined with the light steering does feel a little floaty too. That said, we are grateful for the fact that the A6 comes with the more durable 245/45 R18 Bridgestone Turanza tyres as compared to the gripper but delicate Pirelli ones that you get on the A3. The latest safety features of Audi A6 sedan ensure all-round protection for the passengers during critical situations, like fast braking and accidents. In order to shield the passengers from the impact of collisions, in the event of accidents, the dual-stage airbags deploy automatically. The standard safety features of the automobile include anti-theft alarm, Anti-lock Braking System (ABS), Electronic Stability Program (ESP) and “Servotronic”, for precise control at high speeds and effortless parking. The new Audi A6 does all that a prospective buyer in this segment would look for and it simply excels in quite a few areas. The vehicle is very practical, offering tons of luxury with everyday usability. Not only does the A6 ride splendidly well, it also offers reasonably good handling and remains extremely surefooted at high speeds. Factor in the splendid performance from the V6 diesel engine and well crafted interiors and the new A6 immediately becomes the top pick in its segment.